Which Way is RIght? 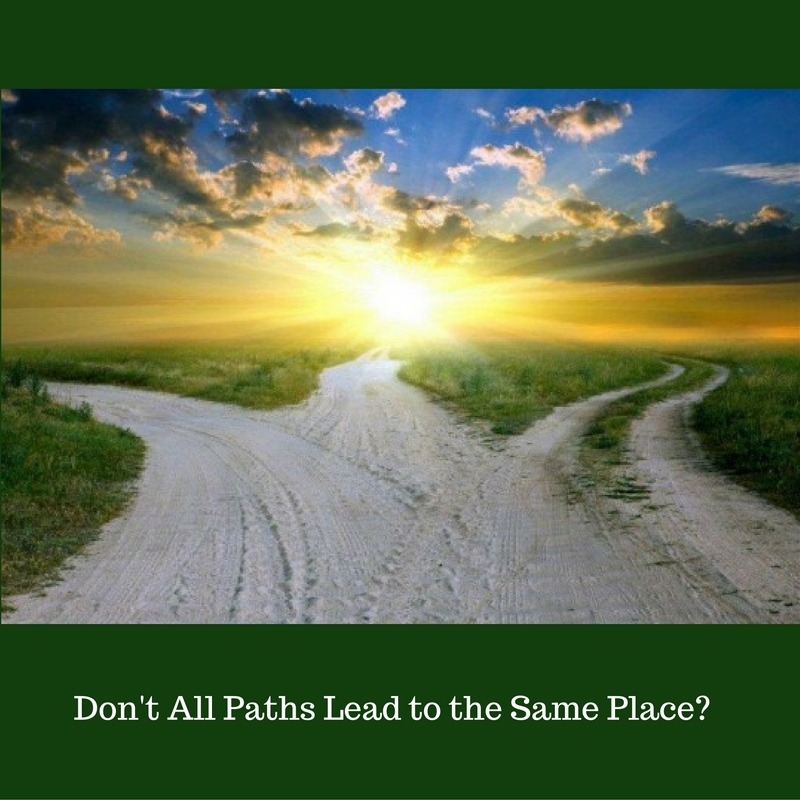 Don’t all Paths Lead to the Same Place? Is there only one way to heaven? Do Christians have any right to be exclusive about heaven? The Bible says this: “Neither is there salvation in any other: for there is none other name under heaven given among men, whereby we must be saved.” (Acts 4:12, KJV) This is a singular statement that was made to explain a radical event. In Acts 3 Peter and John healed a beggar who had been lame from birth, telling him in words that have been memorialized in a well-known children’s song, “Silver and gold have I none, but such as I have give I thee; in the name of Jesus Christ of Nazareth, rise up and walk.” The Sanhedrin (whom Peter addressed as the “rulers of the people and elders of Israel”) arrested them and held them overnight. Then they questioned Peter about how they had healed this man, and he said (vv 9-10), “If we are being called to account today for an act of kindness shown to a man who was lame and are being asked how he was healed, then know this, you and all the people of Israel: It is by the name of Jesus Christ of Nazareth, whom you crucified but whom God raised from the dead, that this man stands before you healed.” Peter then concluded that salvation could also only occur through Jesus. Three things: 1) What have you seen God do in your life that you cannot help but speak of it? Don’t give in to social pressure, don’t hesitate because you might feel too pushy. Talk freely about what God has done for you. Your perspective is legitimate testimony about who God is, and how He has impacted your life. Testify! 2) Giving financially is good thing; but don’t ever let silver and gold take the place of personal ministry. When you let God work through you, it will bless others, and it will bless you. And to contradict Jerry Maguire, it has nothing to do with money. Show me the LOVE and you can show me the WAY. The world will offer substitute salvation through doing good, following a charismatic or powerful leader, attaining Nirvana, obeying the law, or achieving spiritual enlightenment. All of those approaches have some merit, but none of them provide salvation. They are cheap imitations of the real thing. Am I being narrow-minded by rejecting those other beliefs? Yes. If you were honest, you’d admit that sometimes you HAVE to be narrow. You can’t just ignore traffic laws and remain safe while driving. Yes, the laws restrict you from racing through red lights or driving the wrong way onto the freeway, but they are designed to keep everyone safer on the road. It is only by giving up your freedom to drive however you want to that you can drive safely. If you were dying from a tumor that required a delicate and life-threatening operation, would you prefer a surgeon who said, “Oh, there are lots of ways we can treat your symptoms, and we can perform a number of medical procedures on you that will be good for you. They all provide help, and really they all end up at the same place.” Or do you want a surgeon who says, “We have located the problem and I am going to perform surgery to remove it. Now, we have to exclude all of these other treatments because, while they might provide some benefit, we have to address this life-threatening disease in a radical way.” Being narrow minded is a good thing when there is adequate proof to exclude other alternatives. 4) The Sanhedrin had proof standing right before their very eyes, but were blinded by their own assumptions and positions of power. Don’t be that guy. These other alternatives have various ways they sell their solutions, but only Christianity has Jesus. If someone can come up with something better than Jesus, I’ll follow it. But the more I know him, the more I know he was right when he said, “I am the way, the truth and the life. No man comes to the Father, but by me.” One Jesus. One way. But this: Rise up and walk again! In the name of Jesus Christ, be healed!" That I am proudly walking now. Because it caused them an affront. But they would not; I hope they don't.